Before the game there was a general feeling of nervousness and uncertainty amongst the Saints fans who had made the journey to Anfield, though these settled somewhat when the team was announced. The starting XI, with the inclusion of Morgan Schneiderlin and Maya Yoshida, had a familiar feel with all of last season’s strengths and weaknesses on show. It was re-assuring to see Morgan in there- and indeed his performance was an assured one- while the inclusion of Yoshida brought back memories of familiar weaknesses at centre back. Dejan Lovren, last year’s rock now on the other side, was roundly booed with every touch, in contrast to the frequent chants of ‘One Rickie Lambert’. Indeed, the match began to take on the feel of a therapy session for Saints fans. The first half, however, was not very therapeutic. The difference in approach between Saints’ former manager and Ronald Koeman was immediately apparent. While Pochettino would have instructed his players to press, press and press in an attempt to put Liverpool off their stride, Koeman instructed his team to keep their shape with 5 across the middle, be disciplined, allow Liverpool possession, but don’t allow them to penetrate. With this unfamiliar approach came nervousness and it was a mistake in the middle of the park which saw Saints lose possession to Jordan Henderson who produced a ball of huge quality to find Sterling, who had made a run between Clyne and Fonte. Continuing his form of last season, the outcome was not in doubt. Saints were 1-0 down. Although the first half did not calm the fears of Saints fans, there were some positives. Bertrand and Tadic, the new partnership on the left flank, linked up well together and appeared like they had been playing together for far longer. Perhaps Liverpool’s unimaginative recruitment policy has left Saints with the better player between Lallana and Tadic. And after a summer where James Ward-Prowse has been warned countless times on social media that this is the season where he needs to step up, he did precisely that. For the first time in his Saints career he was actually picked as the preferred choice in a position that suits him rather than being asked to fill in and do a job. As the most advanced central midfielder, he linked up well with those around him and also put sufficient pressure on Steven Gerrard that the former England captain was largely ineffectual with the ball at his feet. Despite that, the half time whistle did bring a sense of relief for the Saints fans, who hoped for a transformation with the break. And, indeed, it came. Graziano Pelle, who had cut an isolated if enormous figure in the first half, was able to get more into the game. Tadic and Steven Davis, so rigidly hugging their respective touchlines in the first half, now came inside to create a familiar feel to the pattern of play. The personnel may have been different, but the intricate passing play was certainly reminiscent of last season. Liverpool could not get a hold on the match in the second half and indeed, whenever they got the ball their play was inevitably broken down by Victor Wanyama or Morgan Schneiderlin in the heart of midfield. And Saints came again in waves. And then the goal, a direct result of Koeman’s change in approach. With Davis gone from the left wing, Nathaniel Clyne found the space in front of him to bomb forward in the inside right channel. And with Tadic coming off the left wing, Clyne found him an ideal foil with which to play a one-two. Tadic’s touch, and Clyne’s onward run, created space for Clyne to rifle the ball into the top corner of the net. Relief flooded both the players and the away end. The Saints were back. The pattern of the match continued after the re-start. 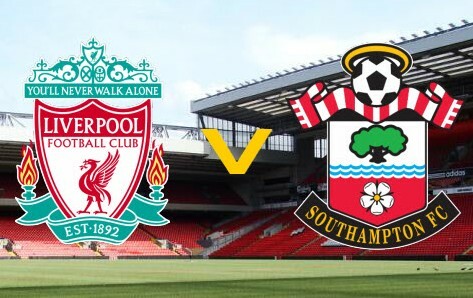 Saints would attack, Liverpool would hold us at bay. When Liverpool found a way of attacking us, Wanyama was invariably there to break it down, win the ball back and set us free once again. But then, as our familiar old pattern of attack took us forward, old defensive frailties also appeared. After Steven Davis missed a golden opportunity to put Saints ahead, our failure to deal with a ball into the box allowed space for Sturridge to stab home. The goal highlighted the need for a commanding centre back to deal with issues in an uncompromising manner. Sterling, the shortest man on the pitch, was allowed a free header in the penalty area to find Sturridge in space. It was a goal that should not have happened. However going behind did not stop Saints’ attacking play. When Pelle set up Schneiderlin in the area, we should have got the point we deserved. But Mignolet somehow tipped the ball onto the bar, and Shane Long, on as a substitute for Dusan Tadic, somehow headed wide from a few yards out. When the final whistle went, Anfield rang out to a chorus of ‘Oh When the Saints’, for despite the loss the relief was clear; after the summer of upheaval, Saints were going to be OK. Just as we had done numerous times under the guidance of Pochettino, we had gone to a top 6 club and lost despite holding our own. It all felt very familiar. The Saints players left the pitch to much-deserved applause but it was Rickie Lambert that every Saints fan was concentrating on. With the Saints players gone from the field of play, ‘One Rickie Lambert’ rang out once again and over he came. Saints fans were allowed to say a last goodbye to the hero, and now we can all move on.